In two years, the Granatkastaranscarband 90 program has gone from contract to delivery. FMV's Director General, Göran Mårtensson, says he was impressed when he received the first four vehicles. The project manager at FMV, Lars Taraldsson, and his counterpart at the industry, Ulrika Berg, together with their respective project groups and representatives from the Swedish Armed Forces, piloted the project until the handover of the pre-production vehicles. 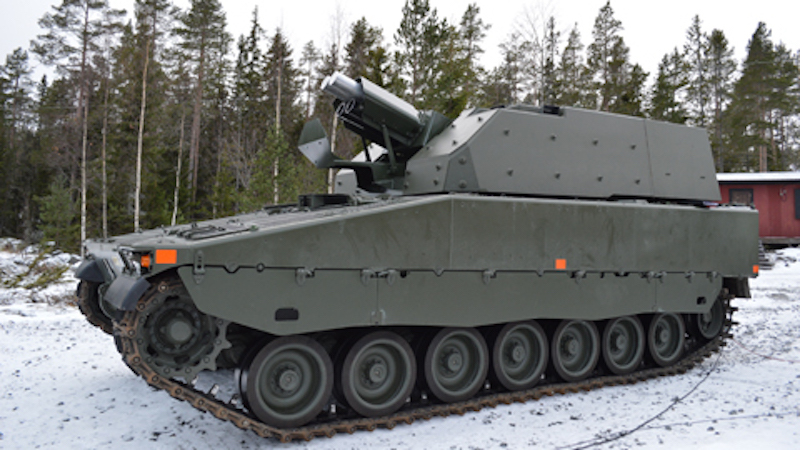 The Granatkastaranscarband 90 (armored grenade launcher vehicle 90, or Grkpbv90) is to act as a battalion’s organic artillery and is based on Combat Vehicle 90 chassis. In terms of performance, Grkpbv90 will meet the current criteria when it comes to firing rate, and they will be considerably faster to group and move, as all the equipment and personnel are inside the vehicle, together with their own navigation system, POS2. This means that platoons with Grkpbv90 will have increased ability to support the armor units by being faster at grouping, shooting and regrouping. A platoon with towed mortars moves in ten minutes, while the Grkpbv90 can do it two minutes, and is also ready to move one minute after having fired the last round. -- Feb 06, 2019 at 15:00 CET: Corrected an error in the headline and photo caption to reflect that the turret is armed with a BAE Mjölner twin 120mm mortar.